The Story of Light Festival is the story of the educative amalgamation of science, art and philosophy. Conceptualised by Jaya Ramchandani and Nash Paul D’Souza, this festival was inspired by UNESCO’s presentations on the International Year of Light 2015, at a conference attended by Ramchandani. At the end of 2012, Nash, Jaya and their friends from all over the world communed in Goa and developed the spark into a concrete plan. Nash, a freelance graphic and web designer, and Jaya, who has studied physics and astronomy, have been long-time friends. Jaya has worked for many astronomy outreach programmes and is the co-founder of a language solutions company for researchers called Sirius Interactive Limited. The duo provided an example of interactive learning by converting Nash’s house into parts of the digestive system and demonstrating through play how a pão is digested. Although the initial idea was to set up the festival on a small scale in Nash’s house, the enthusiasm that resonated among the friends stoked the fires to take it to a higher plane and reach out to a wider audience. The driving force behind The Story of Light was the desire to promote informal methods of learning. Bound with this is the aim of presenting to the world the intertwining of science and philosophy, as it is. The effectual use of art and design in formal and informal learning was explored, leaving no limits to what imaginative minds could conjure up. Goa was the chosen venue for a variety of reasons. Esteemed as a unique stage for the presentation of an ingenious display of intellect and artistry, Goa seemed perfect as there is a sizeable populace drawn to cultural and artistic programmes and who give credence to the value of festivals by their presence. Apart from the creative forces prevalent and fostering the required ambience, it was Nash’s intent to have the festival in Goa as he is a native of the State. 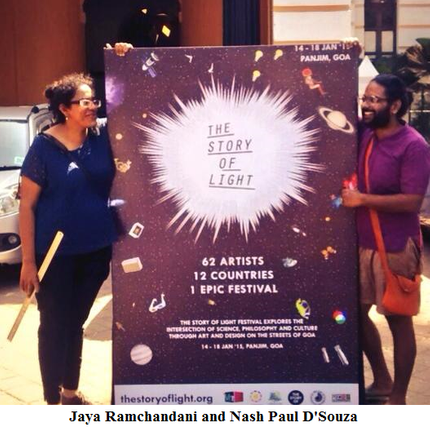 The catchphrase on the website created for The Story of Light Festival was ‘Life as we know it began with light’ and so artists and scientists convened at Panaji to set up 45 projects from Australia, Brazil, The Czech Republic, India, Italy, Japan, the Netherlands, Portugal, Spain, the UK, and the US, to demystify the common man as to the secrets of light and the power held therein. The themes of the projects were ‘Light and Life’, ‘Seeing and Perceiving’, ‘Light in Technology, and ‘Our Universe’. The festival was partly funded by the core team, besides Dynel Lights. The Corporation of the City of Panaji pitched in by supporting the festival wholeheartedly. The days before were spent in extensive preparations that could be seen dotted all over Panaji. This alone did much to incite public curiosity. From the 14th to the 18th of January, 2015, the people of Goa, tourists and especially students were mesmerised by an array of installations, workshops and performances, all completely accessible by way of free participation and location. Old GMC, the Mandovi Promenade, Miramar Beach, the Goa Science Centre, the bandstand near the Panaji church were all taken over by these innovative educationists to portray a new understanding of light through nature, science, technology, philosophy, spirituality, cosmology, history and culture. They held their audience spellbound whilst both informing and entertaining. Abhiyan Humane’s workshop, Light as a Curator, using cyanotype, a photographic process resulting from the action of sunlight on cloth or paper infused with natural salts, allowed interactive participation. Predetermined designs emerged during the course of the day producing beautiful cyan blue prints. 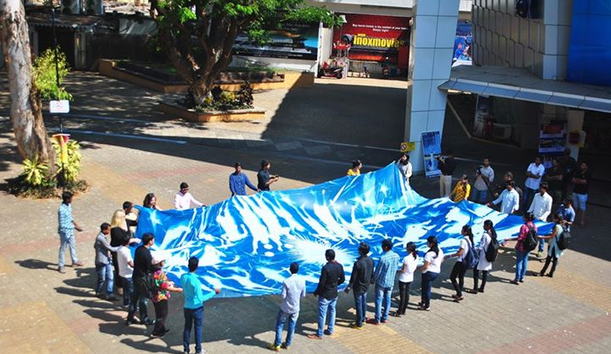 Photopoeisis by Jaden Hastings and Melanie King helped create the world’s largest cyanotype. Divya Karnad and Waylon Dsouza’s installation, Lighting the Way, was a perfect interactive instrument to create awareness as to the danger that artificial lights on beaches pose to baby sea turtles, leading them away from the sea and to their death.  Illuminating the Mind was a workshop held by Christine Fowle that had meditation and enabled one to delve into one’s consciousness and perception. This was held around another installation called the Rainbow Hut. Constructed out of mostly natural material, Tsuneo Sekiguchi and Giulia Moiraghi utilised sunlight, water and mirrors to project rainbow refractions inside the hut. There were also performances under the title of Stimuli that showcased how humans would relate to the world without vision and only the other senses to rely on. These are just few of the projects that were much appreciated and proved to be highly instructive. Needless to say, the first ever science meets art festival met with enormous success, undoubtedly exciting and enthusing scientific and creative minds, young and old alike. The Story of Light will make its appearance once again next year hopefully, and perhaps reach out to other places in India as well with every hope of arriving at the same level of achievement. It is pertinent to offer thanks to Jaya Ramchandani, Nash D’Souza and the rest of The Story of Light team for putting Goa in the spotlight for the right reason.